Justine Nagawa is one of my heroes. I don’t know many 24-year-old women who would board an airplane from Uganda and fly for 24 hours to arrive in a completely unknown place, committed to working with children and teens. But that’s exactly what Justine has done in coming to UrbanPromise in Camden, NJ. 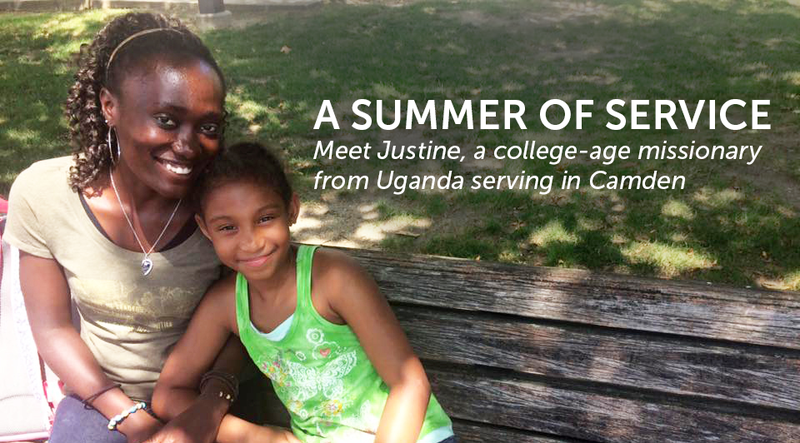 Born a few hours north of Kampala, Justine attended Kyambogo University, where she earned a bachelor’s degree in social work. No university class or textbook could prepare her for working in the heart of a US inner city, an experience that will require her to walk with courage and faith. Fortunately, those fears have dissipated through relationships and knowledge gained once here, which is why UrbanPromise is committed to bringing college-aged students to Camden every summer. Perceptions and hearts are changed, and our children are impacted in amazing ways. This summer, UrbanPromise is hosting summer interns from Malawi, Korea, Uganda, and across the United States. These interns are staffing our summer camps, working long, hot days, and touch the lives of over 500 youth a day through dynamic summer camps, weekly trips, mentoring, Bible studies, and sports leagues. For 29 years, interns have been coming to Camden for a summer of service. But beyond their service here—and to my surprise—some of these collegians have embraced the UrbanPromise vision, bringing it back with them to their cities and countries. I never imagined UrbanPromise expanding to Charlotte, Miami, Little Rock, Toronto, Malawi, Honduras, and a host of other countries and cities, reaching thousands of vulnerable children around the world. My hope is that you will help this summer by underwriting housing and food for one of our volunteer missionaries for a week ($100), a month ($400), or a whole summer ($700). Any gift amount will make a difference! I need your help to care for these missionaries, affirming that their sacrifice and service is noticed and appreciated. I look forward to your reply and to sharing with you the transforming stories of what Justine, the other interns, and you will accomplish in Camden this summer. P.P.S. Do you know a college aged student looking for a gap year service/learning opportunity? Internships are available for the fall. He/she would work alongside Justine and other US and international interns in Camden. For more information, please call Bethany Green, Intern Coordinator at (856) 382-1871 or visit: www.urbanpromiseusa.org/internships.